Just under a year ago, I posted a Q&A based on questions players at Gen Con asked about the Dungeon & Dragons Next rules. With Next now available as the official fifth-edition rules, some of the answers change. This post re-answers the top 4 questions players asked about the D&D fifth-edition rules, and then adds a bonus answer. 1. Are there opportunity attacks? Yes, but you only provoke opportunity attacks when you leave a creature’s melee reach. This means you can circle an enemy without provoking so long as you stay within the enemy’s reach. If a creature’s reach exceeds 5 feet, then you can even move 5 feet away without provoking. If you want to leave a enemy’s reach without provoking, use the disengage action. The disengage action does not include any movement, so it does nothing by itself, but after you disengage, you can move without provoking opportunity attacks for the rest of your turn. Because disengaging takes your action, you cannot disengage and also attack or cast a spell. You only get one reaction per round, so you only get one opportunity attack per round. Due to this limit, and because disengage allows you to move past multiple enemies without provoking, 5E makes fleeing combat less murderous than earlier editions. I love this change. 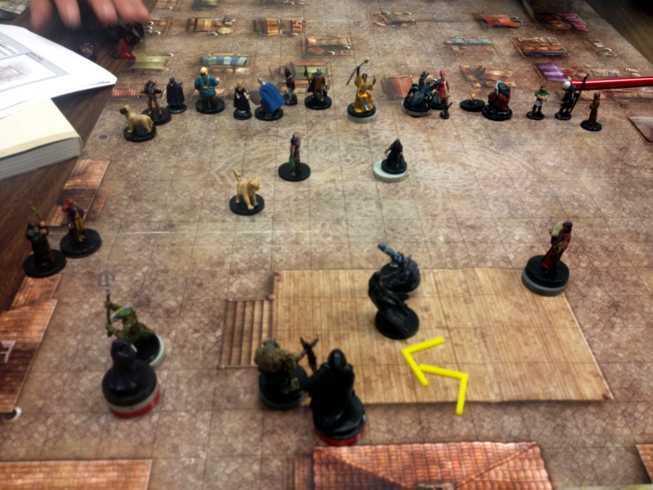 If players find themselves overmatched by a fight, they can run without a gantlet of attacks. Monsters can also run, so monsters can rout and the game can move on without a ritual of endless opportunity attacks. You can freely cast spells and use ranged weapons without provoking. However, if you make a ranged attack with a weapon or spell while a hostile creature stands next to you, you suffer disadvantage on the attack roll. If you cast a spell that does not include an attack roll—even one that forces saving throws—you can cast without any handicap. No, but rogues can Sneak Attack when an ally stands next to their target. A rogue using Sneak Attack this way does not gain advantage, just the extra damage on a hit. D&D tzar Mike Mearls explained that some players find flanking difficult to grasp—not so much with figures that occupy a single square, but with large figures where flanking positions aren’t completely obvious. We may see flanking, and possibly facing, in tactical combat rules. 3. What spells can I cast? In the basic rules, wizards and clerics share similar rules for preparing and casting spells. Eventually, other classes may follow different procedures. Both wizards and clerics know a certain number of 0-level spells, also known as cantrips. They can cast their cantrips at-will, as often as they like. Level 1 and higher spells require preparation. Wizards and clerics prepare a certain number of spells for their day. The number of spells you can prepare equals your spellcasting ability modifier plus your level. Within this limit, you choose the number of spells you prepare at each level. For example, your high-level caster could opt not to prepare any level 2 spells. Wizards prepare spells from their spellbook; clerics may prepare any spell from their cleric spell list. Wizards and clerics both get a certain number of spell slots at each level. You can expend a spell slot to cast any prepared spell of the same level or lower. When you use a higher-level spell slot for a lower-level spell, the spell typically gains power. For example, Magic Missile shoots 3 darts when cast using a level-1 slot, and 4 darts when cast using a level-2 slot. Unlike in earlier editions, spells do not gain power just because a higher-level character casts them. Unlike the classic, Vancian system, you can cast a prepared spell more than once as long as you can spend another casting of the proper level or higher. This system grants casters an extra measure of flexibility, while avoiding the risk of preparing a roster of spells that proves useless, resulting in a bad day in the dungeon. There should be no bad days in the dungeon. 4. Does a diagonal move cost one square or one and a half? 5. Can I disrupt a spellcaster? The rules offer no way to foil spells by interrupting spellcasters as they cast. However, if a spell requires concentration, you can stop the spell’s effects by breaking the caster’s concentration. “Some spells require you to maintain concentration to keep their magic active. If you lose concentration, such a spell ends.” The concentration system limits casters to maintaining a single spell with concentration at once. When casters maintaining concentration take damage, they must make a Constitution saving throw to keep their spell going. The DC equals 10 or half the damage suffered, whichever is higher. This entry was posted in D&D fifth edition and tagged concentration, Mike Mearls, opportunity attacks, questions & answers. Bookmark the permalink. 1. Logically, I never understood why attacks of opportunity do not occur when a character “moves” into the range of another character. Mechanistically, of course, D&D combat would break if this occurred. 2. How can there be flanking when there is no facing? In addition to position, should not the number of opponents also increase the chance to hit? But who wants realism or even rational thinking? Way to messy and complicated. 3. Too bad there’s not a mechanism like fatigue (and mental fatigue). 4. Too bad there’s not a hex map. 5. Hmm. A DC10 verses 3D6 against constitution. Just can’t let the D20 roll die(verb not noun) can we? Though 3D6 against wisdom (or intelligence or will) might be more appropriate. Looks like Next is an attempt to return to some old ideas, but is foiled in doing so. I get the feeling that the sense of what to do is correct, but the mechanisms of how to do it might be off. So much was lost in the name of uniformity during the 1980’s, but at least you can play one of 4 different games now and still call it D&D. So much for uniformity. 1. This doesn’t make sense. In order to get an opportunity attack when entering combat the player/target needs a feat which would indicate they are somehow faster or better at engaging (such as Polearm Master) and thus enables them to engage when a player enters. Otherwise it’s assumed automatically that the combatants are on roughly equal footing and if one has an opportunity, why wouldn’t the other? 2. Flanking and facing are covered in variant rules in the DMG. 3. Running out of spell slots is mental fatigue. Alternately you can use the spell point variant. Either way, running out of spells if your fatigue. Cantrips are the same as your swords or bows, they’re just ranged/melee attacks. 4. You can totally use a hex map. There’s nothing stopping you from doing that. I have one, it works great. 5. It’s still a D20 roll on your save. The save minimum is 10, or half the damage dealt. If you just took 60 damage in one turn, the saving throw would be 30. Hope your D20 has high numbers. Moving *into* range shouldn’t provoke an attack. When you move into range, you have your sword in front of you, parrying blows, etc. The idea of the opportunity attack associated with leaving a threatened square without being careful is that you are turning your back on an opponent without defending yourself. You don’t watch boxing/kickboxing/MMA or study JKD or fencing do you? When someone is moving forward they have disrupted their own grounding, sacrificed stability for mobility and stop hits are key tactical responses in the form of thrusts, jabs, teeps, and superman punch. The only way to really prevent this is a slow engagement which could only be simulated by a rule stating you could not attack when you entered into range without provoking an attack of opportunity. Realism is too hard to make fun and easy in miniatures or pen and paper. Yea but that’s not really in the spirit of what an attack of opportunity is. Jabs, teeps, etc. can and are used against an opponent moving forward but the point is they will still have their guard up and can defend against those attacks even if moving forward. The attack towards an opponent leaving a threatened square is like when an opponent turns their head away and start trying to get away without defending. I sparred many times in kickboxing and that is the worst thing you can do. You no longer have your eyes on the attacker so your vulnerable to anything they throw. I think that’s what the attack of opportunity is simulating. I remain unconvinced. There are just add many ways to withdraw from engagement with guard up as there is to engaging and having that contested. As a matter of fact it is easier to rapidly disengage without taking damage than it is to engage and not take damage. @Don Holt – Moving into someone’s attack zone would not incur an opportunity attack in real life. Fencers go on the attack constantly by moving into the defender, as do boxers and MMA fighters. The defender can sometimes get off an attack, but it would be more of a “Ready Action” (wait for the foe to approach trigger) than a AoO. @DM David – I posted a variant rule interpretation to allow for spell casting disrupts if the DM allows for it. It’s not RAW, but might present some interesting options for the PCs (or the monsters, for that matter). Not precisely true, all the forms you just mentioned have specialty attacks to attack someone who simply wades forward attacking (stop thrust/teep/jab/superman punch). Those arts avoid the attack of opportunity with one primary tacyic, the measured engagement, which is to say they enter range on the defensive and wait until they are within range and then execute their attack. This would be simulated by move but no attack on the same round. Alternatively there is the bull rush, which would get through that range, but properly speaking should be an attack at disadvantage against a readied opponent because of its rushed nature. It’s a matter of range. Entering into long-range does not require any special ability or skill nor are you particularly susceptible to an opponent’s attack (being 5′ away). Closing the range for an attack is very different, however. Realistically, if your initiative is high enough, an attack should provoke an attack of opportunity. If I can cross swords with you I can execute a stop thrust. Unarmed attackers do not provoke attacks of opportunity yet they are capable of attacking from the next square/hex away. It is really a case of arbitrary decisions on the part of the developers…and being a game designer myself I understand that at some point you need to become okay with a necessary level of abstraction because it allows you to move forward and concentrate on the things you’ve identified as central to the experience you want to deliver. That said, AoO entering and exiting when not taking the full action to do so defensively would have made the martial artist in me happier. Hmm… I’m trying to leave a comment but it keeps telling me it’s a duplicate? The map in the photo… Is that available anywhere? The water map is the GameMastery Flip-Mat: Ship. One ship is a copy from the map for Lair Assault: Talon of Umberlee. The other ship is a copy from the Sea Wyvern map from Dungeon 141. Why dragons can’t cast spells while sorcerers come from them? Sorcerers first appeared in third edition when dragons cast spells, so the sorcerer connection made more sense. The 4E and 5E designers felt that dragons better matched players’ expectations when they killed PCs by breathing nasty things and then rending limb from limb. I agree. Still, dragons are magical, and they pass some of that magical nature to sorcerers. Diagonal movement is realistic at full movement rate as long as it requires no reduction to face a specific direction other than full forward. Turning 90 degrees and moving forward does not cost any noticeable amount of time over simply running forward. You can see this on the football field (American or otherwise) where the player with the ball dashes off at an angle from their original position with no difference from those who are to the side and directly facing that player’s new angle and trying to reach that point first. But the distance is longer. Moving ‘diagonally’ does not somehow make someone able to cover more feet. So if you are counting movement by feet, then yes, 30 feet is 30 feet. But if you are counting it by something like 5’x5′ squares, then it obviously is not realistic to count diagonal movement as eaquivalent to movement that is perpendicular to one of the square’s faces. Sure it is longer, but not by 50%, close, but not the same. A five by five foot square is going to be a hair over seven feet long. Cutting the movement in half is not accurate nor realistic. it would be more realistic to say that if you are covering your full movement rate you travel eight squares at a diagonal rather than 6. You could allow full movement and disallow bonus actions, stating it is “eaten” by the movement. Just depends on how you want to do it. I just find calls for realism for something like this, but the person not wanting to go the full way, and just stop at something equally unrealistic odd. Definitely a personal failing (on my part). Who said anything about 50%? We follow the traditional rule of counting every other diagonal square as two. That means you get 4 diagonal squares in 30 squares of movement. Do the math, you’ll see it works out pretty close (28.3 feet). Ah, then I misunderstood what rule was being referred to , my bad. Second option I thought about would’ve been to put 4 ability points in charisma if that’s possible or put 1 in dexterity and another point in constitution just wondering other readers think? They seriously weakened the abitlity points and I don’t even want to get into the human class! You cannot stack all the ability point bonuses into one ability. As you’ve discerned, adding points to a stat you use a lot helps much more than adding points to a stat you hardly use. That’s why a human can get a total of +6 to all abilities without it being a whole lot better than the mere +2 some other races get. Thanks for commenting. The half elf has to split the two +1 ability bonuses between two abilities. You get two skills for being a half elf and two more for being a warlock for a total of 4. Be sure to select skills that don’t overlap with the ones you get from your background. If you go by the way it is worded. Your Charisma score increases by two, and two OTHER ability scores of your choice increase by 1. I don’t quite understand how you thought it would work to begin with… Other would indicate different than charisma, as well as, also being different than each other.